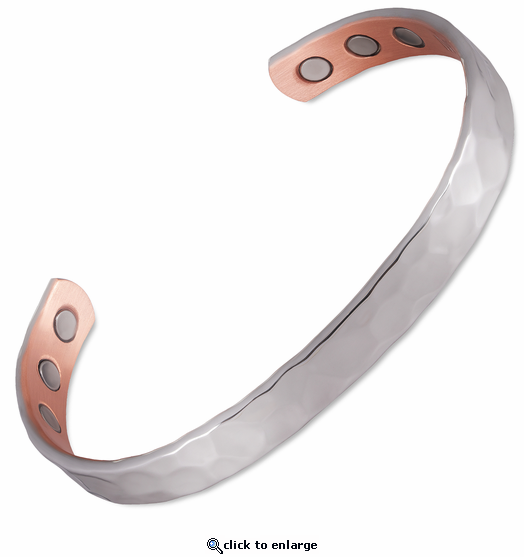 This is a popular copper magnetic therapy bracelet for both ladies and men. Styled in silver hammer, this silver plated nickel free copper bracelet is about 1/3" wide. It has 6 powerful 3000 gauss neodymium rare earth bio north facing magnets and stainless steel magnet caps for added durability. The picture does not do justice. I have purchased this identical bracelet for my husband, uncle, cousin and good friend. All have benefited and experienced relief from symptoms. Have not seen the benefit from the bracelet yet. May be too soon to tell. Quality was good and is attractive. I wear it every day. It's a beautiful, well made piece! This is my favorite magnetic bracelet. I wear it all the time. I also just bought one for my friend and she loves it. Its very shiny and feels like very high quality. I have both the hammered copper and the silver color hammered copper. Both are beautiful, comfortable, and the more I wear them, the better I like them. On me, they work best worn upside down, because the 6 magnets are always touching the skin! In other words, I wear the opening of the bracelet on top of the wrist. Try it! Yes, they really work for health! Positive Experience, will purchase again. Lovely appearance; I can wear it with my nice silver. And works well. Awesome bracelets!! I've bought 3 and they work!!! The bracelet arrived quickly and it really works for the 83 year old lady I ordered it for. Her pain went away soon after putting it on. Excellent outcome!! My lady is delighted, says it is beautiful. Service was outstanding so everybody is happy. This bracelet is absolutely gorgeous. I get asked about it all the time just because its so pretty. Nobody even realizes that ur t is also helping me with my energy! LOOKS AND QUALITY ARE GREAT, I TWO STYLES ONE I WEAR OUT ON SPECIAL OCCASSIONS AND THE OTHER EVERYDAY, MY EVERDAY ONE IS A COPPER BRACELET AND DOES LEAVE A LITTLE DISCOLORATION ON MY ARM BUT NOTHING MAJOR. Reply By MJS: The color is natural and can easily wash off. If you prefer no coloration, consider stainless steel magnetic jewelry. Almost felt it made an impact instantly, very good. I never believed that my knee pain would go away but ever since I have worn my bracelet I have had no pain in my knee. I would recommend this to anyone!!! Very attractive and very reasonable cost. Received promptly and enjoy wearing. Great, great product! Very happy with the quality and the price! I have shopped around and the prices are GREAT! Will certainly be back for more. I like this bracelet a lot! The bracelet was purchased for my wife who suffers with a degenerated disc in her back and arthritis in both her back and neck. She had to roll out of bed in the morning and now feels several years younger with less than half the pain she previously had before wearing the bracelet. We also think the bracelet looks very nice. One was also for our son who has arthritis in his right hand before he started wearing the bracelet he would wake up at night with severe hand pain . Now he tells us that the pain in considerably less . I would rate them a 5 of 5 in all aspects. I love this bracelet. It has helped me out so much. I suffer from arthritis and this bracelet help my hands not cramp up. Great product, it really works and fast shipping. My husband really likes this. Just got it to day...and just what I wanted!! Thank you very much!! So pleased!! GREAT product that really works well. I love this bracelet! It is beautiful and easy to wear 24/7.